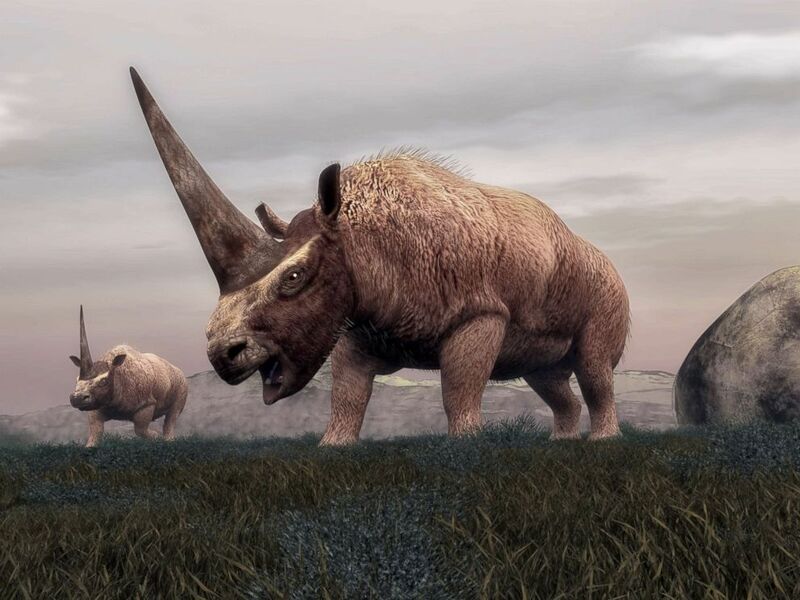 New research just published suggests that the "Siberian Unicorn," an ancient species of rhino, existed much longer than previously believed and walked the earth at the same time as modern humans. Scientists originally thought that Elasmotherium sibiricum, commonly referred to as “Siberian Unicorn,” died out around 100,000 to 200,000 years ago. But a recent study published in Nature Ecology & Evolution, a peer-reviewed journal, reveals the species was alive until at least 39,000 years ago, a contemporary of both humans and Neanderthals. Researchers from the UK, Russia, and the Netherlands used radiocarbon dating on 23 bone samples of the animal to determine how old they were. “They very strongly all confirmed that this species survived until at least 39,000 years ago, and maybe as late as 35,000 years ago,” Adrian Lister, a researcher at the Natural History Museum in London who was part of the study, said in an article published by the museum. This stock rendering depicts the Elasmotherium mammal dinosaurs walking in the steppe grass in Siberia. There have been roughly 250 different species of rhino throughout Earth’s history, according the Natural History Museum in London, but only five species of rhino remain. Climate change, along with particular dietary requirements, could be factors that contributed to the Siberian Unicorn's extinction. The animal, which weighed up to 3.5 tons, lived in modern day Russia, Ukraine, Kazakhstan, Azerbaijan, Uzbekistan, Mongolia and China. Even though the Siberian Unicorn was twice of the size of the species of rhino alive today, researchers said it was adapted to running. However, they are unable to detail much more about its behavior with any certainty. While I'm sure climate change was a factor, that doesn't explain how they managed to survive the four previous glacial periods. The only significant difference is that THIS glacial period had modern humans outside of Africa. No wonder there was such a huge population explosion in China. Can you imagine the fertility powers of ground Rhino horn from a horn of this magnitude.